From left to right: Mary Darcy from AOA, Justin Priddle from Berkshire Bank (which provided $1,000 of the prize money), Josh and Jamie Wallbank, Dan Ciampino of Staff Ciampino, and Tom Tongue of the Tech Valley Center of Gravity. 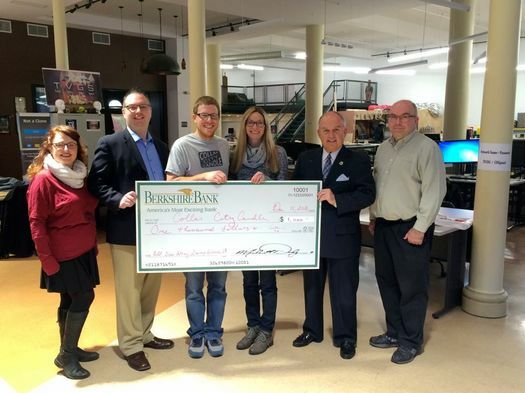 Let's face it: One of the reasons we do the Startup Grant is because of the big check. Collar City Candle will be using the $2,500 prize pay for expenses related to incorporation, trademark, and copyright for its growing business. Thank you this year's contest sponsors: CDPHP, Staff Ciampino & Company P.C., Certified Public Accountants, The Tech Valley Center of Gravity, The Community Loan Fund of the Capital Region, The College of Saint Rose, and Berkshire Bank. And their candles smell divine! Congratulations! Love these candles! Great people, a joy to see at the Troy Farmer's Market. Congratulations to them! Their candles are great and its always a pleasure to see them at the various markets. Very friendly folks. Wishing them lots of success! Outstanding! I'm going out to buy a bunch of candles tomorrow to celebrate!! !